The sun has finally decided to make an appearance in the UK and it is starting to feel a lot like spring now. I decided that instead of my usual dark coloured nail polish that I'd really have some fun this week and start wearing more pastel and bright colours on my nails. I've been playing around with the nail tattoos that I got inside my goodie bag from the Ax Paris Event. I really want to start doing loads of nail designs and since I don't own any nail art pens yet the sticker tattoos really come in handy. 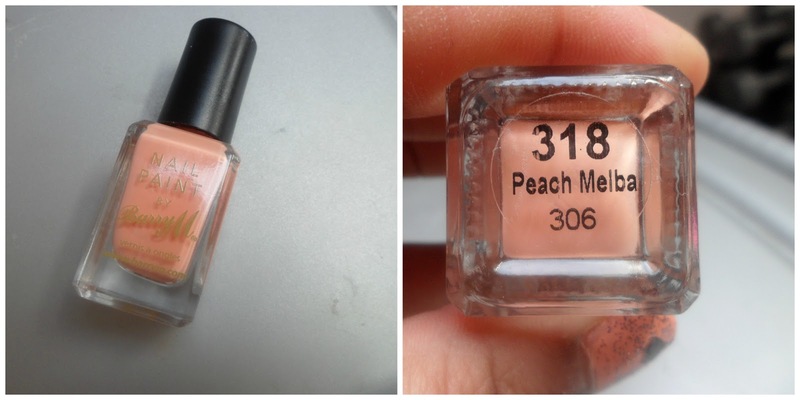 Barry M's Peach Melba polish will always be one of my favourite spring/summer polishes. Ally purchased it last year just when we both started getting into beauty so it'll always be a true favourite of mine and not to mention that it really is a gorgeous shade of peach and it looks so lovely when the sun comes out. I decided that I wanted to make my nails quite girly as well so decided to put a bit of 'Comet's Tail' by BeautyUK on as it is such a nice glitter with little silver bits in. I already own a few glitter polishes and with this one I really like how when you apply it doesn't come out in big chunks, it covers the nail so nicely. Lastly, I wanted to use some of my nail tattoos but I didn't want them to cover every nail so decided to just put two black hearts from the packet onto my thumbs and I loved the way it came out. I love how there's so many designs that you can do with these nail tattoos. 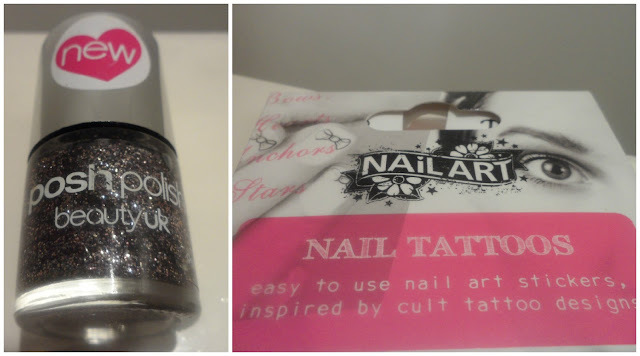 If you want to get your hands on these nail tattoos then they are sold in Boots, Urban Outfitters and skinartuk.com! 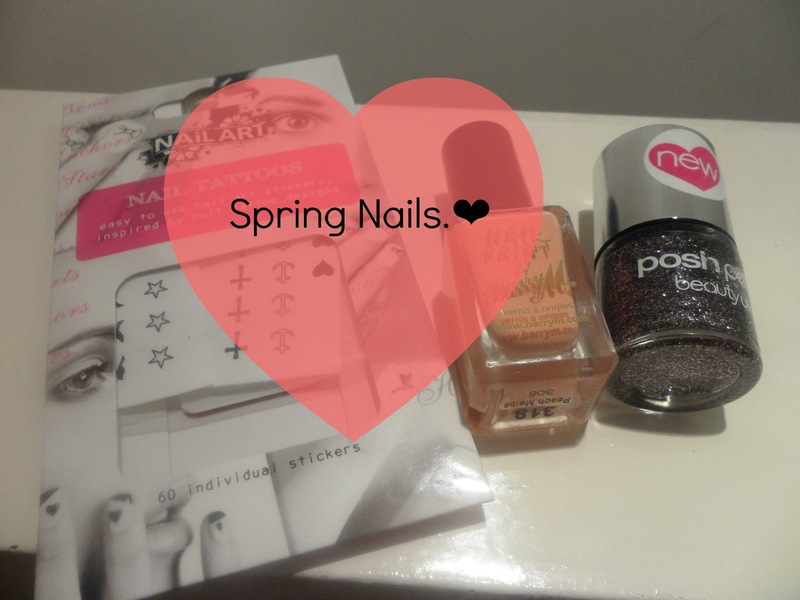 What do you think of my spring nails? what are your favourite spring nail polishes? 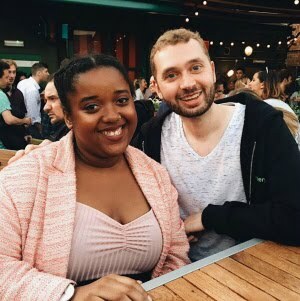 love this color and also your blog! It's so nice!!! I follow you! Thank you lovely! :) will do!